I recently focused my attention on the 'rake attack'. Interesting to discover I could not find it. I could not find it in Heorodtus. I could not find it in Thucydides. Nor in Plutarch or Diodoros from later times. I could find it in Ben Hur and Anthony and Cleopatra or Rome Total War but according to the people who were there at the time it was not. The only authentic oar rake? There are many things which are counter-intuitive with galley warfare and the 'rake attack' is one of them. It is logical that ships collided and that oars were broken. 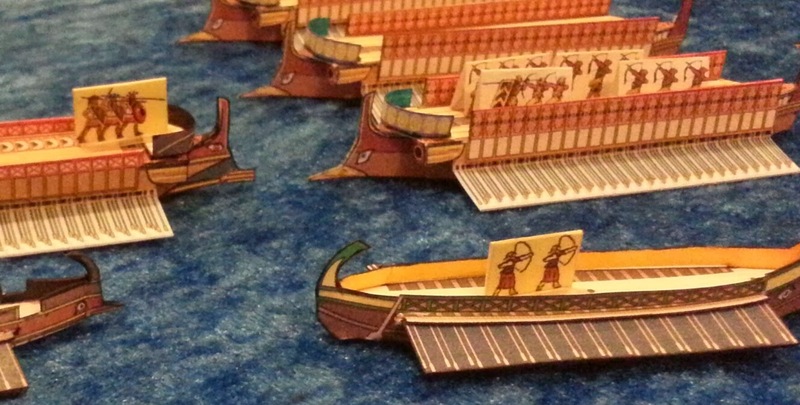 It is logical that getting one's oars snapped-off was a serious disadvantage in battle. Oars can snap if stressed enough. Ergo ships snapped each other's oars the better to do the enemy in. However, looking closer it seems less likely. One of the reasons I accepted the existence of the raking attack was an article in Conway's History of the Ship which seems to set it in a technical context. (Ch.9,p.134) Quoting an estimation that a galley moving at 5 knots could break 50 oars seems to set a seal of respectability on the concept. However. The main failure in the idea is that it assmes one side attacks and the other is the target. As with much that is shown and demonstrated with edged weapon combat reconstructions it is very nice when an instructor displays his skill versus a static target, usually a trainee. A factor always worth remembering in respect of galley warfare is that just to sail the ship efficiently all the crew cooperated at a high level and each man was skilled at his job. 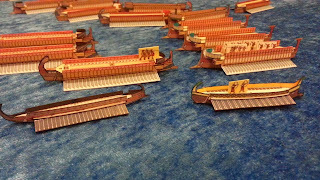 Apart from the initial Roman fleet in the Second Punic War - (and they cheated !) no ship was at sea in ancient time without a competent crew. It was simply too dangerous and the ship too costly to mess about in. Any warship in combat with another was a unit confident in its capabilities and well aware of the opponent's capabilities. Let's take the basic situation for a raking attack. The idea is I sail my ship in alongside an opponent and use my hull or stern to catch, bend and snap his oars. I remain mobile. He is crippled and disadvantaged. I can return to finish him off like a wounded prey. 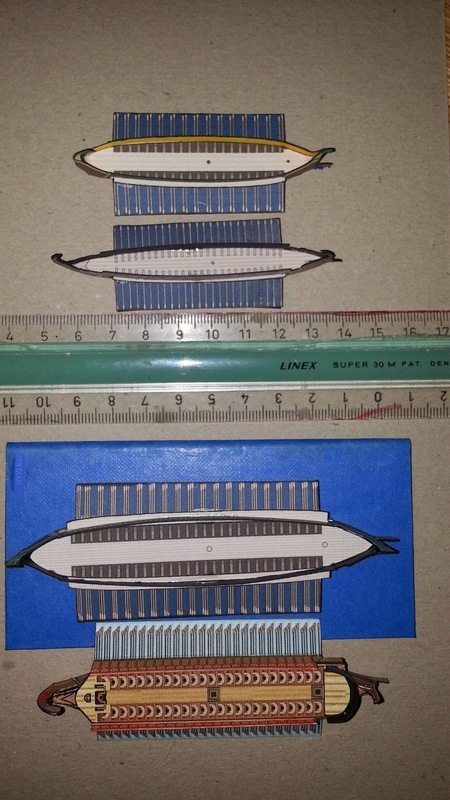 Note in this picture that one side of the target vessel has a row of oar stubs all along the port side. Does this mean that not one shipped his oar in time ? 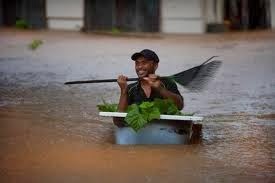 On an oared ships it is often necessary when manoeuvering to take oars inboard rapidly to avoid obstacles. It takes a second or two for a skilled oarsman. 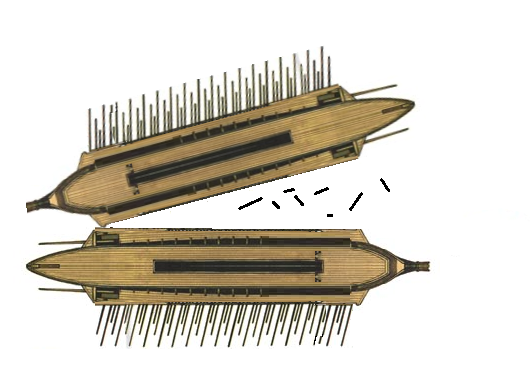 On a large galley like a trireme, oarsmen have an added incentive to ship their oars rapidly. It is 'fear of death'. Should some obstacle - such as ., shall we say an oncoming enemy galley - take your oar as your ship progresses then you find yourself holding thewrong end of a primitive machine which the enemy is using against you. Forget any threat of snapped oars - the threat of a grisly and painful death or maiming is more significant at this moment. Normally one shifts water - or attempts to - with an oar that has a fulcrum close inboard. The force resulting shifts the ship. If a large mass instead tries to - and succeeds in - shifting the oar instead, then the wonderful properties of the simplest machine known to man will press the short length you have in your hands against your body with a force multiplied many times. It is humorous to see people learning to row a 25 m viking ship get into this trouble when they 'catch a crab' but instead of just getting knocked off the rowing bench the situation on a trireme is less funny. The thranites can more easily jump off the bench but zygians and especially thalamians are stuck into a small space. One will likely get squashed against some immoveable wood -- yuck. Ok I exaggerate somewhat. But the concept that the whole crew of the target vessel rows blithely on while they are in danger is not tenable. Firstly, the thranian was responsible for his two mates below. He was, in turn, informed by the rowing master / keleustes or any crew member with eyes in his head - all of whom could see a threat and warn the oarsmen. Once warned, the oarsemen on that side could ship oars and avoid the threat. 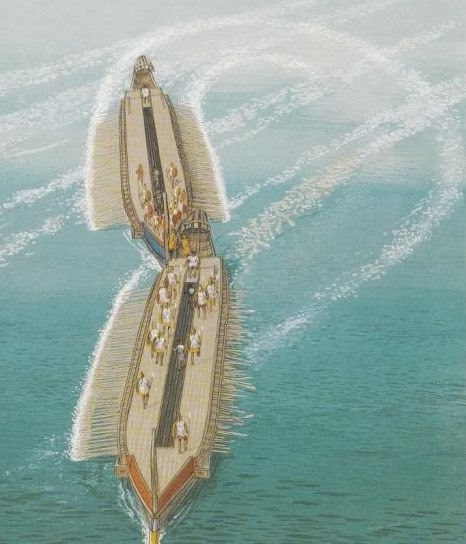 It would take seconds to ship oars, In addition to this, the skipper and helmsman would need to continue directing their ship into danger instead of turning their ram into the enemy or turning and accelerating away. Hmm, maybe a few more degrees to starboard would have been good ? But, but, but ... What if the target could not get away ? It was stopped or stuck ? Well, in those cases why make this 'oar rake' to stop of cripple a ship already stopped or crippled ? Much better to ram him - ram the sitting duck and sink him definitely. What if one approached from behind, faster than the target ? Again...why would a skipper chose to 'possibly, maybe cripple an enemy when he had the chance to ram him and decide the issue more categorically ? Now, back to the technical data which seemed so convincing in John Coates' chapter of 'The Age of the Galley'. (heaven forfend that I should try and contradict anything JC wrote..). Coates model for an oar-rake attack is as follows. Attacker keeps epotis hard up to target's side. This allows more leverage to break oars. Oars pushed back 60 degrees will snap. Oars pushed at offset more less than 1 metre to victims side will not be subject to enough leverage to break. The attacker's port oars drive the ship ahead, crippling the target. 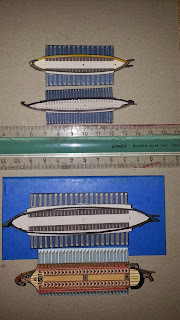 Note that it is the stem post which snaps the oars and the epotis keeps the stem post at sufficient offset to generate enough leverage to do that. So far, so good. Again, there are problems. Coates allows for 50 oars being broken by a ship moving at 5 knots. 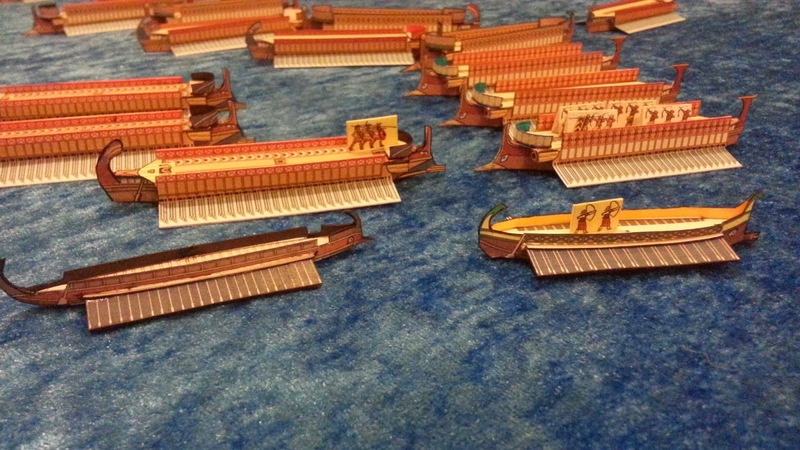 This is not enough to take all the oars (80-90) on a trireme. Does the attacker grind to a halt - beam-on to an enemy who may try his hand at boarding now he has ben presented with a target ? The breaking process will raise alarm and surely some towards the stern of the target will even at this late stage ship their oars. The scenario relies on the 'dumb partner' - if the target steers to port or starboard the deal is off. The angle of attack is changed, the stress applied is reduced and the effect lost. The scenario also relies upon an accurate targeting by the atacker, to set his epotis onto the enemy outrigger. If he hits too early he smashes his epotis on the enemy's. If he hits to late he will not smash as many oars as he wants. Oh, yes.. they also carried spare oars - usually 30 , so the target could not be immobilised with one successful raking attack. Now, this may sound like a good set of circumstances for a wargame. Lots of variables to allow nuanced outcomes according to luck of the dice. In reality, a skipper will carry out manoeuvres has has confidence in. This model for a raking-attack is flawed, in my opinion precisely for the rasons that it makes a nice game. Coates even seems to say that the epotis may have had a definite function in assisting effecting oar-raking in this way. As he knew better than anybody, the epotis was actually a support for platforms in the front-ship and protection against dismounting of the outrigger against collision from ahead. Dislocation of the outrigger would take the thalamian oarbank out of commission. 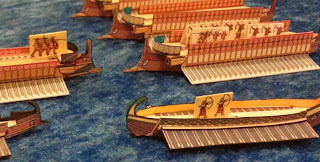 The Corinthians discomfited the Athenians at the Gulf of Erineus by renforcing their epotides so that bow-to-bow collisions resulted in smashing the opponent's epotis. The epotis is the box-like structure with anchor cables running out of it. The outrigger can be seen leading back from it. If the combat function of the epotis was so vital to recognised tactics - as it should have been if oar-raking was one such - then somebody would have been reinforcing them before the Corinthians did, and not just for making bow-to-bow attacks as Thucydides - himself an experienced trierarch - says they were. Does this mean oars were never broken in anger ? No. Collision must have been a messy business with lots of galleys involved in a battle. 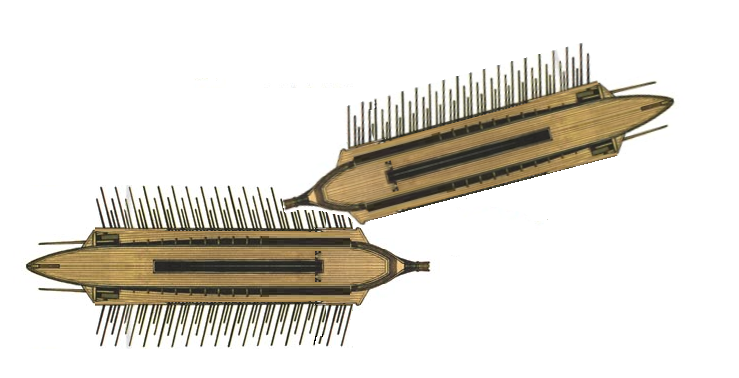 Off-target ram attacks could have a similar effect and, do not forget the oar-unfriendly aspects of a common-or-garden ramming. The main point is that there must be a serious question-mark over the idea of oar-raking as a genuine ancient naval tactic. Always nice to see a galley wargame. Here is one using SOA Corvus rules. Ten-centimetre triremes sail out onto the nervøs-velour sea! Greeks going in against some high-decked Persians. 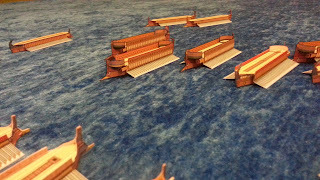 Persian deck troops look ok. Hotz ships in foreground. 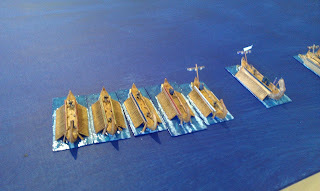 Looking at my Hotz fleets in a despondent mood ... great idea, great ships but wrong size for me. 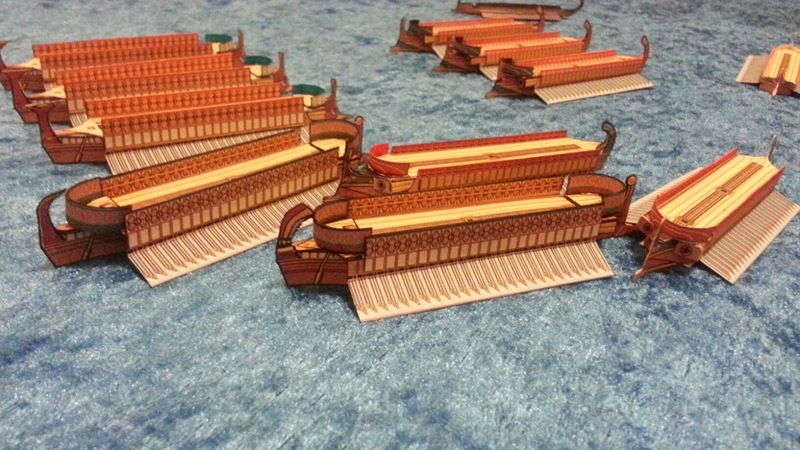 Printed at 66% the triremes from HRS are broader and longer than mine. I could print them smaller - but then the construction process becomes too much for my eyes and patience. 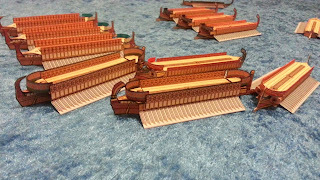 Then, comparing the size of the pentekonter and bireme from HRS I discovered they actually fit ! HRS trirem is a bit over-dimensioned maybe. In any case I can use the others unmodified, just printed at 66%. At 10cm to 35m for Olympias HRS is a bit long and far too broad. But pentekonter and bireme match well to their original lengths. Anyway, nice to discover I can recycle some models. Perhaps I may just grit tmy teeth and use the 30 HRS triremes also..?